All the compounds needed for most jobs! 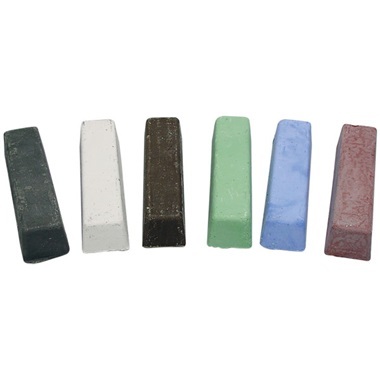 4 oz mini bars are the right size for smaller buffing and polishing projects. Includes: black emery for coarse buffing, white diamond for fine finishing on aluminum and chrome, brown tripoli for fast cutting on aluminum and softer metals, green stainless compound for buffing stainless, all-purpose blue, and red rouge for brass. Made in USA.